Buddy Program | Fall 2012 Newsletter | School of Public Affairs at American University in Washington, D.C.
Three generations of a buddy family. 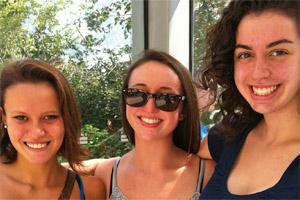 From left: London Swift ’16, CJ Murphy ’15 (Inter Class Coordinator), & Jean Cornell ’14. The transition to college can be a grueling process as freshmen struggle to find the balance between school, extracurricular activities, and having an active social life. The School of Public Affairs Leadership Program aims to ease the struggle for the freshman in the program by carefully pairing them up with an older “buddy” in the program. While the transition to college can be tough and Leadership can be overwhelming, having a buddy by your side can make the road so much easier.